Without a doubt the sunroom at the Coral Cottage is my favorite space. It houses a seating space and a dining space. It totally sold me on the house but Dolly Parton's old saying rings true here: "There's no such thing as natural beauty." The light is fantastic due to all the windows--the porch used to be screened but was later enclosed. We replaced all of the windows so they would operate properly and stand up to high winds. The window unit came out because we put in a central heating and air system and we saved the sideboard but the water heater in the corner had to go! After the room was made secure and the HVAC system was installed it was time for drywall! The old wood ceiling was to die for--I was sooo disappointed that I couldn't keep it (remember the 50% Rule?) but we couldn't crunch the numbers to make it happen and comply with the FEMA guidelines. 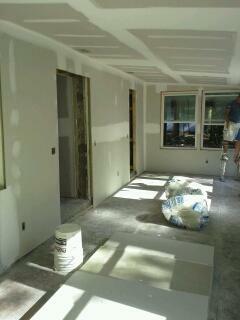 Next came primer--it looks nice already, doesn't it? I'm almost consoled that I had to give up my wooden porch ceiling and beams. Almost. How do you handle the tough decisions about budgeting? Are you resolute and accepting or do you grieve and whine (like me)? I'm glad for your gratitude and that you have the self-control to save.